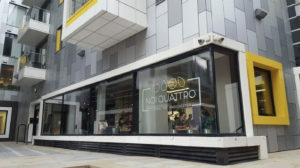 With pride in being the only Manchester pizzeria run by Italians, despite the plethora of pizza places around the city, Noi Quattro opened its doors at the start of the month. Set in the heart of the Northern Quarter in between Mackie Mayor and Common, the restaurant has impressive heritage – as it is being owned by the same people who run The Pasta Factory on Shudehill. Noi Quattro, 120 High Street, Manchester M4 1HQ, 0161 834 9032.